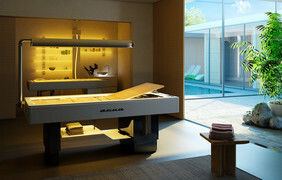 Acua, the Iso Benessere thermal wellness bed, is the only one equipped with the Scottish shower treatment. Scottish shower is a hydrotherapic thermal treatment marked by a wise alternation between hot and cold jets of water. The jet of water, placed at about one meter from the client, is directed from the operator to all the interested areas in order to use the water pressure in outlet to make a massage all over the body. The jet can move from bottom to top with a slow rise and a rapid descent and it’s always placed on the right side of the body for first and then on the left side. The jets are characterized by a fast alternation between hot and cold water, there is no a slow and progressive exchange. You go from an initial temperature of about 26° to reach in about 2 minutes 40° and then sharply fell again to 20° for about 10-20 seconds. These timelines are to consider just indicative in fact the treatment has to be adjusted according to the customer needs. A complete treatment lasts about 10 minutes and, in order to be real effective, has to end always with a cold jet and then a perfect body drying to allow body temperature to quickly rise up and reach the best values. The sudden change of temperature and the different time for hot and cold water cycles increase blood flow, maintain firming skin and help to combat cellulite and water retention. stress to reach relax and a psychological balance. In this case, to achieve the complete relaxation of body and mind, it is possible to add to the treatment music and color. It is recommended to have a Scottish shower early in the morning, as the first thing to do after waking up, in order to encourage a complete muscular awakening and it is not advisable to have a Scottish shower during the digestion process in order to avoid a possible blockage owing to the cold jets on the body. The Scottish shower is also not recommended for use to elderly people and to all those persons with heart disease and arteriosclerosis. To complete the treatment, it is advisable to combine with the Scottish shower a relaxing, drainage and firming massage to enhance the positive effects of the alternate jets. If massage is not possible, it is important to apply even a drainage or moisturizing cream over the entire body. It is essential for a greater effectiveness because skin will absorb cream deeply and totally thanks to the action of the Scottish shower on the pores of the skin. In particular, on the Iso Benessere thermal bed Acua, scottish shower is applied by specific nozzles located on the upper mobile arm of the bed. 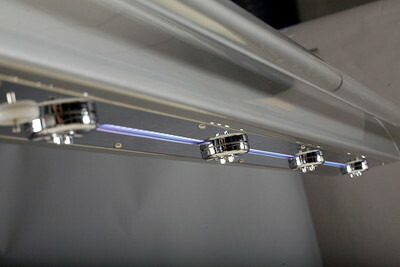 When this arm is not being used, it can be moved manually down to the side of the bed. The temperature of the hot water can be regulated, while the cold water is at natural temperature. The commands present on the keypad and the parameters shown on the display can be used to set the time intervals for the hot water and cold water jets, and the overall treatment time. This treatment can be accompanied by cycles of Chromotherapy and music therapy cycles which can enhance a complete relaxation for body and mind, can be combined together and directly personalized by the bed operator through the display placed on the side of the bed. The nozzle system for Scottish showers has a safety device that halts nozzle operation if the upper arm is moved out of the vertical position (correct operating position), so as to avoid water losses in the room where the treatment is being performed. 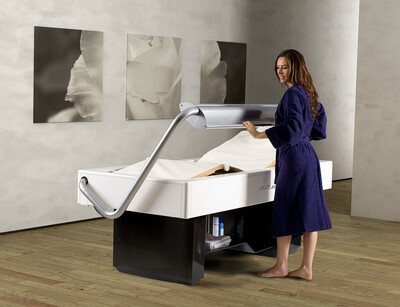 Click here to find some treatments on the ACUA thermal bed.